Summer School 2019 – Register now! 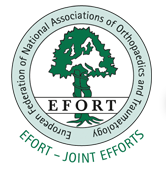 Established in 1991, The European Federation of National Associations of Orthopaedics and Traumatology (EFORT) is the platform organisation linking Europe‘s national orthopaedic associations. Today, EFORT has 45 national member societies from 42 member countries, as well as nine associate scientific members. Bone & Joint Research offers an exciting new route for publication with the same rigorous editorial and peer review process as the JBJS (Br). BJR will use an open access model so that all articles will be freely available to orthopaedic surgeons and researchers throughout the world immediately on publication. ESSKA Academy is now open access. ESSKA Academy, the official eLearning Portal of The European Society of Sports Traumatology Knee Surgery and Arthroscopy has opened her doors to the academic world. You can now reach a wealth of information at https://academy.esska.org/esska. You only need to register once. If you encounter problems please don’t hesitate to contact us at: support@academy.esska.org. VuMedi is a video education platform for physicians, fellows, residents, and members of the allied health community. CME Credits are available for webinars. Wheeless’ Textbook of Orthopaedics presented by Duke Orthopaedics is an online comprehensive resource. Cookies designated as marketing cookies are used to follow or to keep a track on visitors’ / users’ moves throughout the websites. The main purpose is to show off or exhibit advertisements that are relevant by nature and appealing to the user’s eye, therefore, more valuable to independent editors and advertisers. The denominated “non-classified” cookies are those that are undergoing a classification procedure / process, together with the suppliers of individual cookies. A cookie is a small text file that a website places on your computer, phone, or any other device with internet access, containing information regarding the way you “surf” or browse that particular site. Cookies are used to make browsing / “surfing” easier and simpler, and they do not damage your computer. Why are cookies used on this site? - Essential Cookies: Some cookies are essential to access specific areas of our site. These cookies allow site navigation and usage of your applications, such as accessing secure areas of the site by means or through login. Without these cookies, services that require these types of accesses cannot be provided. - Analytic Cookies: We use these cookies to analyze how users / visitors use or surf the site as well as monitor its performance. By doing so, it allows us to provide a high quality experience by customizing or personalizing our offer and by quickly identifying and correcting any issues that may arise. For example, we use performance cookies to find out which pages are most popular, which method used for linking pages is most effective, or to determine why some pages are receiving error messages. Based on the use of the site, we may also use these cookies to highlight the site’s items, goods, products or services that we believe are of more interest to users / visitors. These cookies are used only for the purpose of statistical creation and analysis, without ever collecting personal information. - Functional Cookies: We use functional cookies to allow us to recall or remind the user of his / her preferences. For example, cookies avoid typing the user's name every time the user / visitor accesses the site. In short, functional cookies retain and/or keep user preferences for site usage, so you do not need to reconfigure the site each time you visit. they are used to direct or steer the navigation according to the interests of the user, thus allowing us to provide a more personalized service. - Session Cookies: These cookies are temporary, they remain in the cookies of your internet browser until you leave and exit the site. The information obtained allows us to identify problems and provide a better browsing experience. Yes, cookies can be disabled in Settings (available in the Cookies alert, that appear at the time of the first visit to our site) or in your browser. Please note, however, that by disabling cookies, you can prevent certain web services from working properly, affecting, in part or in full, your website navigation. If you wish to block or delete cookies from this site, you may do so by modifying your browser's settings. Although the parameterization of each is different, it is common to reconfigure or re-establish them in the "Preferences" or "Tools" menu. For details on reconfiguring cookies, see the "Help" menu of your browser.